STITCHED TOGETHER: Peter Dawson, left, Karen Dawson, Hannah Dawson, 7, Matt Dawson, 15, and Rebecca Dawson, 17 in front of a mural the children created while being home schooled in Richmond. Once you get Raewyn Shand talking about her children, it’s hard to get her to stop. This is partly because she is so proud of them, but also because there are so many. This is also because, like the more than 250 home-educators in the Nelson region, she has had a direct role in their successes. Starting from the top then, we have: Jesika, 32, a functions manager at Veneto Club in Melbourne. She’s followed by Sunni, 31, a financial administration and property investor in Auckland. Daughter Catriona, 29, is a climbing technician and rigger with Kordia. Anson, 26, is a wool harvester, working all over the world six months a year, and a farm manager at home. Brianna, 24, is a registered drug and alcohol counsellor, and a Bridge Programme case worker, doing everything from brief intervention to group education to comprehensive assessment. Sebastian, 21, is a second skipper in the aquaculture industry. Nathan, 16, is studying Professional Restaurant, Wine & Bar Service at the Nelson Marlborough Institute of Technology and works at a local restaurant. At home, Mrs Shand teaches Shoshannah, 14, Mahalia, 12, and Azzan, 9. For those not keeping count, that’s 10 children. She’s telling me all this, and a lot more besides, outside the Tahunanui Library one day, where Mahalia is waiting for her harp lesson, taught by fellow home-educator Annemieke Harmonie, who we’ll get to later. Mrs Shand has been home schooling for 30 years at her home in Port Ligar, initially because of the area’s isolation but also because the family took to it so well. At first, she used material from The Correspondence School and the Accelerated Christian Education course, but quickly burnt out with the rigid course structure, and eventually moved to an “integrated thematic unit” curriculum. The whole family completes tasks based along a theme, using a “bus-stop” approach allowing younger ones to work for as long as they can manage before stopping and letting the older children continue. The children can study whatever they want – one chose to learn the intricacies of taxidermy – with specialists in even the most obscure subjects proving easy to find. The more rigid courses had led to difficulties with her children. One daughter had not learned to speak until she was 3, so any expectation that she would be able to read and write at 5 was unrealistic, Mrs Shand says. Her other children have continued this trend, with one son not reading until he was 9 . Most started between 7 and 8 years old. The children are taught until the age where they would leave a mainstream school. “By the age of 16 most have grown wings and are starting to fly. Some fly quicker than others,” Mrs Shand says. Learning at home has also helped her children realise that they can learn anywhere, and from anyone, rather than having the attitude that learning is something done at school, she says. 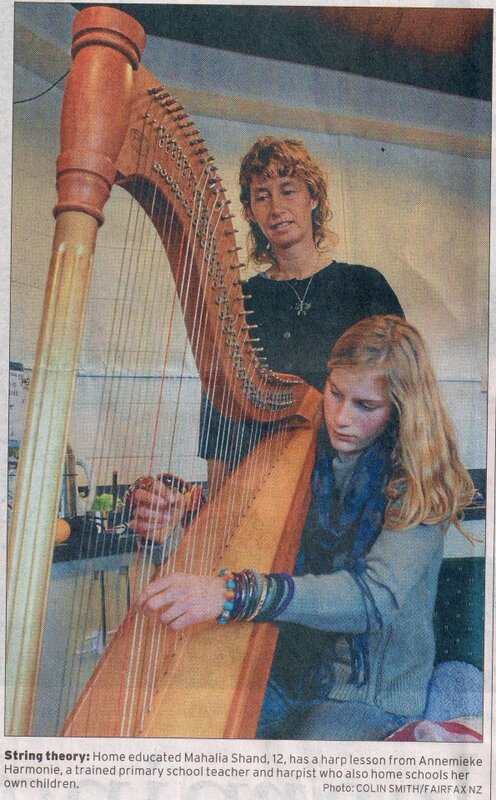 Harp teacher Annemieke Harmonie is similarly passionate about her experiences as a home educator. Since moving to New Zealand from Holland, after travelling the world playing her harp, the trained primary school teacher decided home schooling would provide the best education for her three children, son Miro, 12, and daughters Ester, 10 and Lisa, 6. They start their school day by spending 2 hours working hard on reading, writing, maths, music and art, then eat a nutritious lunch, and then spend the afternoon exploring a variety of interests, ranging from drawing to karate, cheese-making to weaving. One of their favourites is chess, and in 2010 Miro and Ester were part of a team of home schoolers who won an Otago intermediate school chess championship, despite being much younger than the other competitors. Part of her motivation to become a home educator was to avoid giving her children a school experience similar to her own, Ms Harmonie says. “I went back into my memories of my youth, thought what were the best memories, when did I learn the most, when was I inspired. “I saw that 99 per cent of my learning experiences didn’t happen in school,” she says. A common refrain from high schools is for students to keep their options open by gaining as many qualifications as they can, even if they don’t intend to use them. Ms Harmonie says she’s open-minded about this. For those considering becoming a home educator, she advises them to do their research and determine whether it is for them. You sacrifice a part of yourself, she says. “You become very intimate with your children, you know them so well, that you know what they enjoy, and you know their strengths and weaknesses. “My daughter is not very good at spelling, so we spend more time with her, and my son helps her and they start helping each other. They work hard to make sure there are no gaps in the children’s learning, making sure each topic is revised, she says. “You have your moments, everybody has their moments. “I can’t say it’s the perfect system, neither is anything else I’ve been able to find. Next I talk to Peter Dawson who is on the leadership board of Nelson Christian Home Educators group, with a membership of 55 families. He and his wife, Karen, elected to educate their children at home partly because his own education was so good, but also to provide them with a strong Christian world view and a classical education. He was educated in a Catholic private school in South Africa, receiving a rich classical education in small classes. “My view of education comes from that world view,” he says. The only alternatives were to either send his kids to expensive private schools or home educate them. Home schooling allowed them to tailor the curriculum to the skills of the particular children, whether it was science or English, offering a degree of flexibility that Mr Dawson thinks is unavailable at most mainstream schools. “Quite often, in my view, the schools have to teach across a wide range of abilities, have to strike a medium between the clever high performers and the low performers. What they are obliged to offer is a generic education, rather than one tailored to the specific needs of the individual,” Mr Dawson says. So for the past 14 years, Karen, a trained teacher, has taught their four children – Rebecca, 17, Matt, 15, Pippa, 12, and Hannah, 7 – at home, following the Sonlight programme, a Christian curriculum. The children spend the morning hard at work, starting with chores around the house, then moving to a timetable incorporating key disciplines like maths, English, science, and Bible study. That last subject is particularly important, as it gives the children a worldview and a context in which to live their lives, he says. A Christian world view obviously affects the content itself, particularly in subjects like history, geography and science. “If you don’t believe in a creator and believe that the universe started with the Big Bang then that is the context through which you will present science,” he says. They still teach them about scientific theories they do not necessarily agree with, and leave the children to decide what they believe. They do the same with other religions and belief systems, showing the children what others believe and getting them to view Christianity in a wider context. “It’s training them to think,” he says. Mrs Dawson says home schooling has allowed her to make sure her children are taught by someone who loves them, wants the very best for them and can tailor a curriculum with God at the centre from the best international sources. “Within schools you get very talented teachers who are brilliant. You also get those who are there to pay the mortgage. But now their two eldest children have elected to go to mainstream colleges, Garin College and Nelson College for Girls, to make it easier to gain access to university to study medicine and dentistry. Home schoolers who go to university can generally gain acceptance by presenting examples of their work but, with these subjects, the admissions process is a lot more competitive, so the family decided to play it safe. With a foot in both camps, she says the choice to home school is up to every family. Rebecca says she enjoys the social side of college, particularly the “hustle and bustle” of the school. She already had a lot of friends at the school thanks to her sports and music hobbies. The only thing she found odd was spending the majority of the time with people her own age – a situation she had never experienced in real life. The academic side also initially took some getting used to, with less one-on-one study time, and a lot of time “wasted” – walking between classes, for example. In English, they study only one book a year, rather than the one book a fortnight she read while being home schooled. It has also been tough to adapt to the vagaries of NCEA, with markers looking for specific answers. But being in school did have its academic advantages, including access to specialist equipment such as laboratories. Matt likewise enjoys his time at Garin, with his classmates and teachers alike friendly and encouraging. But following the pace of the whole class was sometimes difficult, after so many years learning at his own speed. Peter Dawson has strong views about home schooling, and was quick to contact the Nelson Mail after a story featuring local principals suggesting the sector needed to be brought into line with the strict accountability faced by schools. The Education Review Office ceased regular reviews of the sector in 2009. The principals also said home schooling could lead to children with a narrow world view, gaps in their education and a below-standard education – criticisms that home schoolers say they hear all the time. Mr Dawson says the principals did not put their views forward in a considered way. He had come into contact with some home schoolers in the past who were not discharging their responsibilities properly, but the comments from the principals had tarred every home schooler with the same brush. There are students who were not keeping up in the mainstream system as well. 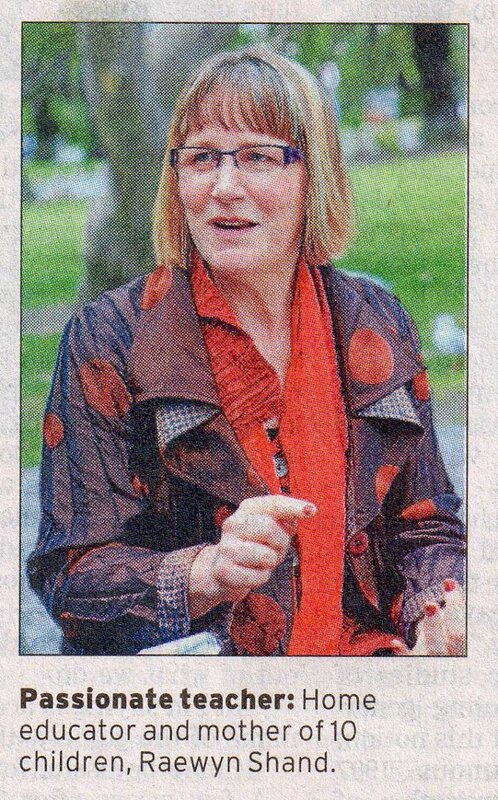 Mrs Shand says she doubts parents who were not interested in teaching their children well would become home schoolers. Those struggling to teach complex subjects could always get help from specialists. Ms Harmonie says the comments seemed very fear based, and did not jibe with her experiences. Academic studies of home schooling generally support this notion, with a famous 1997 study, “Strengths of Their Own: Home Schoolers Across America”, showing home schoolers in the United States outperforming their mainstream counterparts by an average of 30 to 37 percentile points. This performance jump was independent of race, gender, income and government regulation. Hampden Street School principal Don McLean was one of the principals who expressed concern in the original story, and since then he says he has been contacted by several people both critical and supportive of his stance. He says he was never “having a crack” at home schooling itself, but was raising the issue at a time when mainstream schools were more accountable than ever. It would only take one or two home-schooling families to do a poor job to “let the side down”, and there was no-one monitoring the sector to catch that. He could understood why it was not a priority for the Education Review Office, but suggested making standard assessments used in schools available for parents to access if they wanted. Undoubtedly there would still be kids who fell behind in the mainstream system, but schools had mechanisms in place to pick up those kids who fall through the gaps. “We all try our hardest to get our best out of what we do. “All I’m saying is accountability is the name of the game with what we do. A few weeks after first meeting Mrs Shand, we go out to visit the Dawsons early in the morning, to grab a photo of the family before some of them leave for their days at work and school. Rebecca and Matt are in their respective school uniforms, and Pippa and Hannah are dressed for the cold morning. As we pull out, Matt begins his walk to Garin, and Rebecca starts her own car, on her way to Nelson College for Girls. Mrs Dawson, Pippa and Hannah head inside the house.